Come celebrate with us! We would love to be the host location for your next special occasion. Think of Pilgrim for your next anniversary, birthday party, retreat, meeting, memorial, fundraiser, wedding, reception, rehearsal dinner, community function or whatever other event ideas you may have! Pilgrim Congregational UCC has a large variety of historical, functional and eclectic spaces to fit almost any space need. Our Fellowship Hall has a seating capacity of 250 people, is renovated and is a very versatile space. The room can be set up in a variety of ways to allow dancing or a podium and small stage for a speaking engagement. The hall is connected to our Parlor room by original sliding wooden doors and can be opened up to allow extra space for an additional 60 people. Chairs and tables are provided upon request at no additional charge. The event hosts are responsible for decorating the hall, as well as cleaning up immediately following the reception. Music and dancing are heartily welcomed. Pilgrim does allow beer, wine and champagne in accordance with our alcohol policy (see PDF document here). Directly off of the Fellowship Hall is our fully renovated Kitchen. Our Commercial Kitchen is fully equipped for large events or for regular users. We often host not only catering companies, but also local food producers as well. Whether you are looking for a kitchen space for a jam making operation, ice cream production or whatever else you can dream of our kitchen has the capacity. We have commercial refrigerators, freezer, an eight burner stove top with double stoves and convection oven with hood, a three basin sink, prep sink and sink with sprayer and built in disposer and a commercial dishwasher. Whether you are looking for one time food prep space for your event or a more regular kitchen rental space, we can accommodate! Our Theater (photo) is a beautiful and simple space. There entire room measures 47’ x 28’. There is wooden stadium seating for 70 with room for additional seating to be added up to 99. The theater has a large white wall that is perfect for projecting films, art or slideshows. There is a second floor balcony that adds character and a historic relevance to the room. This space is great for dance performances, movie screenings, theatrical productions, rehearsals, yoga class or whatever else you can imagine. Our Chapel (photo) has a seating capacity of 60. New windows let in a wonderful amount of light. The room is equipped with a supplemental Air Conditioner, an upright piano, podium, small altar, two tables; one with seating for 10-12 people. The Chapel can be used for meetings, small weddings, memorial services or mid-sized community events & programs. Our Parlor (photo) artfully combines conference room functionality with Victorian era décor and elegance. There is a large conference table that has seating for 14, but can be separated into 6 separate tables if classroom style seating is preferable. There is a small seating area with a couch and rocking chairs around the fireplace on the far end of the room. There is space where a screen and projector can be set up as well. The Parlor is wonderful for meetings, smaller gatherings or its large mobile wooden sliding walls can be opened up to the Fellowship Hall and it can be used as an extension of the hall. Our Office/Studio Space(s) are great spaces for long term rentals. We have served as a home location to other local non-profits, massage/Pilates therapists, counselors and many more local individuals and groups renting out office or studio space here at the church. We currently have one exclusive use studio space available. It is approximately 375 SF and can be used in a variety of ways. Call the Property Manager today if you would like to set up a viewing. Our Sanctuary is the largest and grandest of our spaces at Pilgrim. It is both a beautiful and historic Sanctuary, with a seating capacity of 500 people (300 on the lower level, 200 in the balcony). Besides being the space used for Sunday morning service there we also host regular concerts and recitals in the Sanctuary. 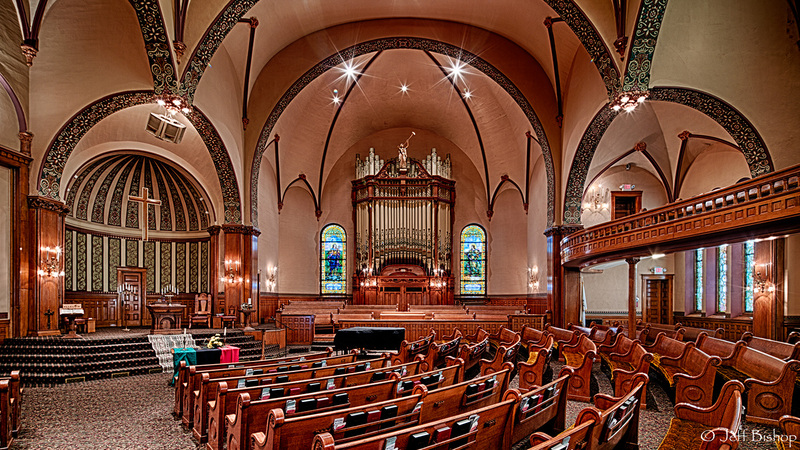 The Sanctuary space houses an original 1894 Farrand & Votey pipe organ, restored by Holtkamp in 1992. The organ’s beautiful music is still regularly enjoyed by members and visitors alike. It is one of three still working in the US. The organ is flanked on either side by two Tiffany-style stained glass windows, both featuring images of St. Cecelia, patron saint of music. One of the highlights of the space is the exquisite 24 stained glass dome, designed by Elizabeth Parsons. The north wall is also lined with stained glass windows, and a large stained glass rosette window in the balcony. Our Gymnasium includes a full-size basketball court with small locker rooms and showers. Our Little Theater is most regularly used as a dance and yoga studio. It is a large east-facing room behind the balcony with a marley floor, high ceiling and another grand stained glass rosette window. Our Classrooms are situated along the outer halls of Pilgrim and can host small meetings (5-8 people). To rent a space at Pilgrim, contact our Property Manager, Bridget Kent-Marquez, at bridgetk@pilgrimalive.org or (216)861-7388 Ext: 102. Her regular office hours are Monday-Friday 9:30am-4:30pm. She will be glad to answer any questions you may have and set up a time to walkthrough and show you the building. It is important to us that you have a positive experience at Pilgrim. We are always looking for new people, groups, organizations etc. to share our wonderful spaces with.